I honestly couldn't be more excited to post this today!! As you know, I LOVE strollers! Especially ones that have a ton of versatility and are worth their price a million times over! I've partnered with We're Parents!? 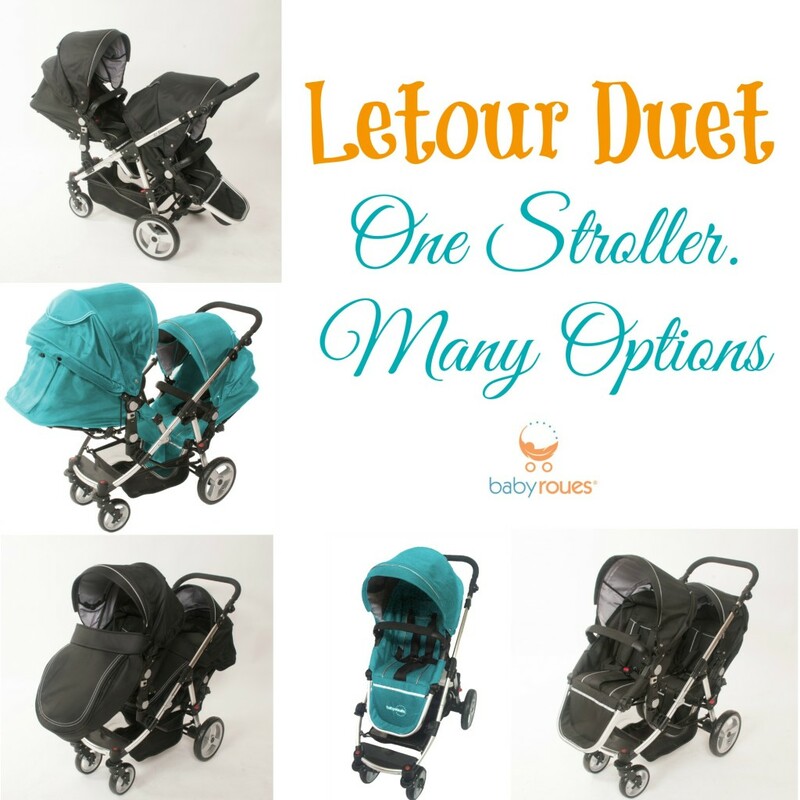 and other bloggers for this is the FIRST ever giveaway of the BRAND NEW babyroues Letour Duet and we are excited to be apart of it! babyroues has over 30 years of experience manufacturing baby strollers, always looking for the newest innovations to meet customers needs. They are dedicated to coming out with technological advances for both mom and baby’s comfort. This year they proudly announced their first tandem stroller, the Letour Duet. The Duet is a deluxe and versatile double stroller that can be used as either a single stroller or a double stroller. With multiple options, both seats can either face each other, both face forward, or both face the parent. Seats have comfort padding and both fully recline for the best comfort experience. With the purchase of a carseat adapter, a car seat can be used with one of the seats. 2 year warranty for manufacture's defect. Free spare parts for life of stroller. currently comes in either black or teal. Price includes 2 separate canopies, 2 foot covers, and 2 raincovers. 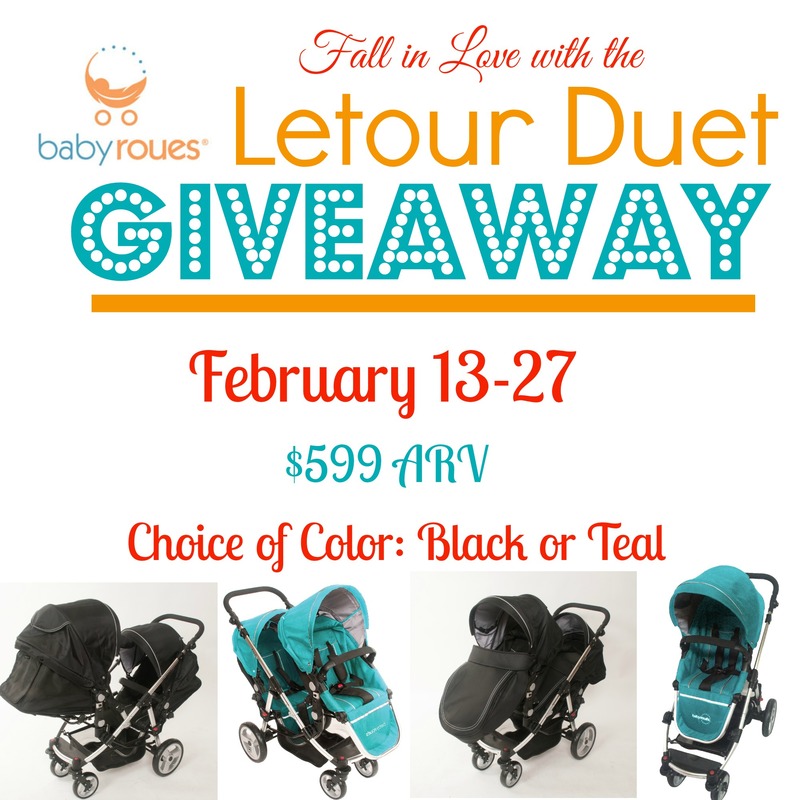 One lucky winner will receive their choice of either a black or teal Letour Duet. Open to US ONLY. Must be 18 and up to enter. Void where prohibited. One entry per household/IP Address/Name. Winner subject to verification. Winner has 48 hours to respond to e-mail or a new winner will be chosen. Giveaway runs from 2/13/15 at 12am EST to 2/27/15 at 1am EST. Disclosure: We're Parents!? received monetary compensation for the creation and set-up of this giveaway. This blog did not receive any products or monetary compensation for this giveaway post or the promotion surrounding the giveaway. We're Parents!? and participating bloggers are not responsible for prize fulfillment. Prize shipped directly from babyroues. Facebook, Twitter, Pinterest, Google, and any other social media are not affiliated with this posting or giveaway. This disclosure is done in accordance with the Federal Trade Commission 10 CFR, Part 255 Guides Concerning the use of Endorsements and Testimonials in Advertising. Black is what I would pick!